Mezuzahs Made by 3-10 year olds. wood, glass, metal, pens and more. 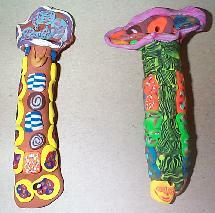 See my Clay page and my Picture Page for general lessons and ideas for using Polymer Clay. Eileen's Clay Mezzuzah Charms and Clay Hebrew Name Necklaces. I taught only two days at camp this summer! These pictures are only some of the 65 mezuzahs we made! We used the bulk clay in terra cotta color of Sculpey for the base. We decorated with regular cane slices pf Sculpey. One on right was made by non Jewish Student. I taught 4 group to make 65 mezuzahs. I used 2 boxes (3 1/2 pounds total) of the Terra Cotta Sculpey (or white Sculpey in boxes). For the decorations I managed to use less than 40 ounces of clay. More colored clay would be used if you decorate the entire object front and back. We mainly did only a few slices and snakes on the front only. A mezuzah is the object used by Jewish people to mark their door jams. It includes a prayer written by a scribe in Hebrew on a parchment. It is used to mark the Jewish home and protect the people in side. Many Jews mark all doors in a house they live in : kitchen, bedroom, office , den etc. Therefore, they need lots of mezuzahs. Others only mark the outside door. Mezuzahs can be made of ceramics, wood, metal, glass, clay etc. Each year parents ask me to make more mezzuzahs. I found a copper tube about 4 inches long in a recyle hardware store. Any solid object with a diameter of 3/4 - 1 inch is ok. The form gives children a hard work service. This helps the children so they don't collapse the project when working on it. We wrap it with aluminum foil making sure that the ends are left open. This allows the rod to slip out before baking. This is more cost effective when you are making 100. Or the bulk Terra Cotta color Sculpey that comes in a 1 3/4 pound box. We roll a sheet of clay out either by hand or using a pasta machine. or have the children help you with the pasta machine. Have them play/soften the clay. or roll flat sheets about 1/4 inch thick. Children love taking turns turning the handle of the pasta machine. Wrap the sheet of clay around form. Shape the clay as desired, leaving the top with an opening and the bottom closed. Put a whole in the top and bottom to allow for the mezuzah to be hung on nails. The form can be decorated in any manner you wish. This can be done in 1 or two classes. One to soften the white (or colored) clay for the form or for the canes. Second day to make or decorate the form. I usually taught about 4 or 5 classes a day. Each class does a part the first day. Younger children softening/playing with the clay and rolling sheets through the pasta. The older making jelly roll canes or other patterns. The teacher's or aides taking the sheets and covering the form on the first day. The second day before or during classes cutting the canes onto wax paper covered cookie sheets for each table to share. All classes get an assortment of most canes. Give each child a piece of wax paper to give them a clean surface to use and to keep your table free of any chemicals. Make sure to mark the childs name gently with a pointed object or tooth pick on the back of the mezuzah. Children often forget what their project looked like. Decorate using canes and snakes. In the pictures on this page, we used cane slices and twisted snakes. When little children, I cut them and helped them decide which colors and slices to put on. Depending on your budget you could put on a few or many slices. Twist together and apply to edge. Roll out a little clay to put the Hebrew Letter Shin (Represents G-d's name. )on the top. Use tool to make a hole on the top and on the bottom for hanging. When cooled coat with Sculpey Gloss/Satin Clear Protection. 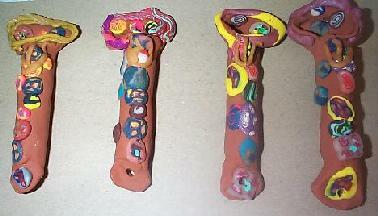 Directions for making clay canes and slices made from canes can be found on my clay page. Pictures of mezuzahs that I make for sale can be seen at Chadis Crafts. Although these designs are copyprotected they are still a good place to get ideas for your own designs.